If you are new to Brio you need to understand how it works. It is very straightforward. Each piece is like a wooden jigsaw piece in that they have a peg and hole – a male/female coupling system. They are not a tight fit, allowing a little play between pieces which means with a little wiggling everything will line up. 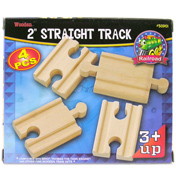 This helps to avoid derailing and also lends the tracks to fit to all different sorts of configurations as well as being easier for small fingers to fit together. Brio call this their ‘vario system’. This enables pieces to join together into a complete modular system. Each piece also has grooves in them to allow the trains to run along them. 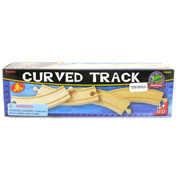 Brio’s tracks are instantly recognisable as unpainted, high quality beech wood with an excellent smooth finish. 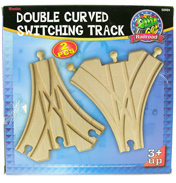 Brio has a unique gauge to themselves, as do most other wooden train tracks. 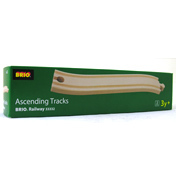 Indeed may other cheap, less well finished imitations use Brio’s gauge as THE standard. Where a switch is required – e.g. change of direction or to change tracks the piece has multiple grooves. Some too are sloped to let the tracks ascend or descend, vital if you are trying to get the trains up to higher level bridges. Brio has clever mechanical switches too which have reversible track segments operated at the flick of a switch as well as a mechanical turntable which is a must for any set. The auto-stop start switches too are great in conjunction with the appropriate engines. Here you will find all the pieces needed to create your perfect Brio railway foundations, plus other items needed to enhance and enlarge existing sets. 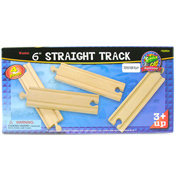 Simple bits of straight track can be really useful when adding other accessories, for example the Brio Magnetic Bell would be great with the Mini Straight Track Pieces as they are both the same length, so you don’t end up with odd lengths of track. 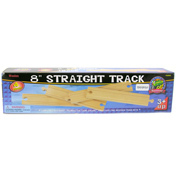 Looking at track shapes, the classic Brio starting shape is an 8 piece circle – this can then be adapted into a figure of eight with the help from a crossing in the middle or perhaps even a bridge. Circles are a great way of getting more tracks into a small space and also to keep the train going without stops, both of which are key aims in any circuit design. They can easily be extended into squares or ovals too. One important thing to remember when designing a Brio track layout is to start from the outside and then work in, then you know your external limitations, otherwise the set can easily take over the entire living room! 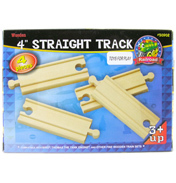 You can use pieces such as bridges, track supports and crossings to help where tracks meet, and use end stops for the end of the line. 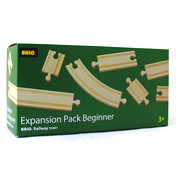 The Brio Expansion Switches Advanced Pack is a great way of introducing new layouts into your existing circuit and combined with one of the other expansion sets either beginners or intermediate there are hundreds of different variations available. For bridges you need to ask yourself, are you a safety first person or totally outrageous? Well we have something to cater for all here! 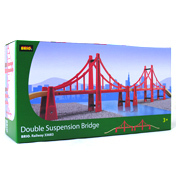 If you like to play it safe then the Double Suspension Bridge may be for you, it is safe and classy, and you won’t fall off this one. But if you’re at the other end of the scale then we would recommend something like the Collapsing Bridge for added excitement and entertainment. But be careful it doesn't collapse when you’re crossing! Maybe you have a really creative mind and would like to design your own bridge, the bridge supports, combined with sloping tracks, are great for this and you can even get stackable ones!. Plus there are loads of other great things to add to your track such as the level crossings which can help maximise ideas for role play. If you still feel like your track needs something more? 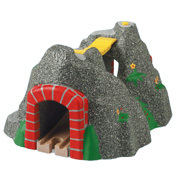 The try adding a tunnel which is always exciting, particularly if it is one of the adventure tunnels complete with sound effects! Plus watch out for that falling tree on the Rocky Road Tunnel. 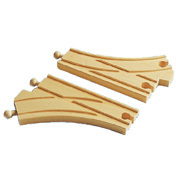 There are lots of great ways to get more out of your Brio wooden railway. There are literally heaps of different outcomes with each new piece of track you add and you can have hours of fun trying different layouts. It’s all quite addictive.